The 16th century nobility of Northern Europe were far ahead of their time when it came to social media. In 1560, the young folks of what's now called the Netherlands and the Rhineland didn’t trade digital “likes” and tweets, but they did have a way to share their thoughts, comment on other people’s opinions, seek advice, and celebrate whatever song they were really jamming on with their friends. They were called alba amicorum, meaning “friend books” in Latin. The trend started with young men who left home to travel Europe and visit scholars and universities as part of their wider education. When they met up with a philosopher or scientist or fellow student, they’d have them write a quick little entry in their album amicorum to document the meeting—kind of a cross between a yearbook entry and a LinkedIn recommendation. Noted artists of the day might be hired to provide illustrations. Ladies of the time, of course, usually didn’t have the opportunity to travel the continent seeking out the brightest minds. But they still kept friend books, ones that became even more personal and revealing than the portfolios young men amassed. They would draw in each other’s books, share secrets, scribble inside jokes, and gossip about their romantic prospects. As a result of being passed around from friend to friend, these books tend to be a little more cluttered and a little less photogenic than the neatly organized recommendation books men created. 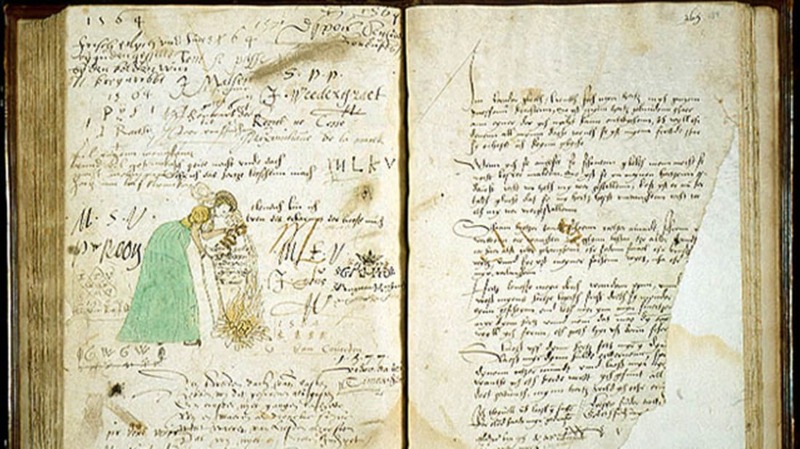 "The alba kept by women are mostly full of ‘ugly,’ ‘busy pages’ on which up to 15 people scribbled down their name, motto or a short saying," Sophie Reinders, a Dutch PhD student who specializes in the study of alba amicorum, told mental_floss. Instead of links and GIFs, an album would contain the lyrics of a hot new song, or personal poetry, or an illustration. Party guests would write down their memories of a great event. When two people got married, they would create a joint entry together to announce their union.